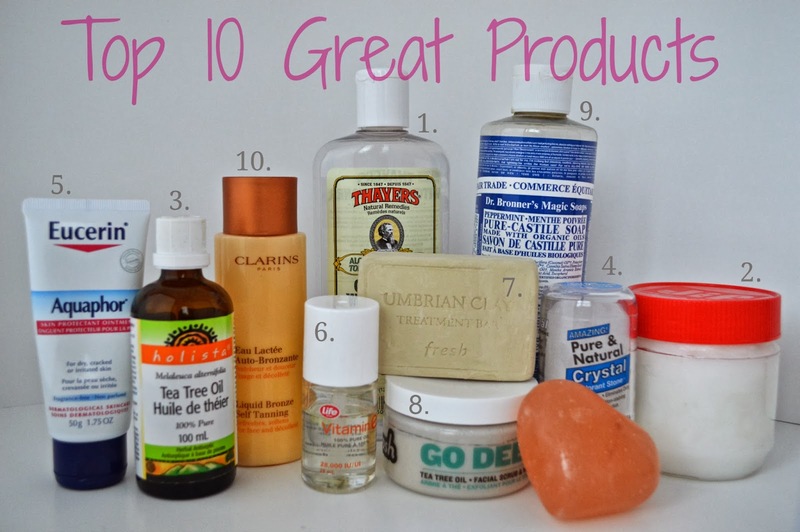 In this post, I will be highlighting my top 10 products which I am constantly reaching for and always have on hand. These products truly work and most of them have multiple uses. I have included some tips on where they can each be purchased and an average price, which will vary from one retailer to the next. Take note that all of the prices are listed in Canadian dollars. This is the most gentle and effective toner ever. My favourite versions of it are rose (calms redness), cucumber (fresh and clean), and the regular unscented option. I like to pour this into a smaller spray bottle, which I buy from the dollar store, to use as a refreshing mist after washing my face/body. Immediately after towel drying my skin, I spray this witch hazel all over and lightly tap it in with my hands. It reduces dryness, lightly cleanses, and balances pH. Using this product makes me feel so fresh and one bottle lasts forever, especially when used as a spray. You can even put it in the fridge to use as a cold, refreshing facial spray in the summer. The best part is that it's ALCOHOL FREE. My real question is, why do alcohol toners even exist? Alcohol ruins the skins natural balance, causes breakouts and excessive dryness. Get this stuff instead! If you want to use it as more of a cleanser, simply pour a bit onto a cotton pad and sweep over the skin either in the morning or evening as a gentle toning cleanser. A total win for me. This can be purchased at nutrition stores and from various retailers online. This oil is quite the multitasker. First up: makeup remover. Rubbing a bit of coconut oil on waterproof makeup will allow it to dissolve and be washed away with a face cleanser. I also love using coconut oil as my all over body moisturizer. I apply the oil when my body is slightly damp after a shower as it helps lock in the moisture. This is a great option for dry skin, but still works fine for more oily skin. My favourite trick is mixing it with one or two drops of tea tree oil, to prevent ingrown hairs on my legs, and breakouts on my chest and back. If you have dry hair, applying some of the oil to the ends of your hair works wonders as a hydrating mask. Put it on before bed, wake up, shower it out and you hair will be extra shiny and healthy looking. On occasion, I really enjoy a teaspoon of it on raisin toast! This can be purchased at any grocery store or Costco for a lower price. This is my skin saviour. A very strong, herbal smelling saviour, at that. Tea tree oil is antimicrobial and doesn't cause my skin to dry out and react like most other acne treatments. NOTE: use this oil in careful moderation. It is poisonous if taken internally and can be harmful if applied to the skin in large quantities. My favourite cleanser, mentioned in #10, is tea tree oil based and has been very effective at keeping my minor breakouts at bay. Unlike salicylic acid and benzoyl peroxide, the most popular blemish fighters in the skin care industry, tea tree oil does not disrupt the skin's natural balance- when used in moderation. Whenever I see a blemish developing, I will dab a bit of this oil on top of my moisturizer before bed, and it will frequently help speed up the healing process. Also, if I happen to extract a blemish, I will use another dab of the oil (administered on a q-tip) to clean the area to prevent further eruption. No one wants further eruption. Something to note: NEVER use rubbing alcohol on your face to "clean" the skin. It will only do bad things. believe me. This can be purchased at drugstores, Costco and nutrition stores. Salt has many uses, one of them being cleansing and deodorizing. The first salt deodorant I have is the "Pure and Natural Crystal" which I purchased at Bulk Barn for just a few dollars. The second one is the heart shaped Himalayan salt crystal purchased from a local Toronto company. These salt crystals are very heavy, and are used with a bit of water. All you need to do is rub it gently on moist, clean skin (you can wet the salt instead of your skin) and allow it to dry. This will reduce body odour but NOT reduce perspiration. This is a great natural option for less active days when a full on antiperspirant isn't necessary. So if you plan on running around town and only using a salt crystal, keep those grey shirts far, far away, friends. This can be purchased at Bulk Barn or nutrition stores. Now this stuff is legendary. Celebrities swear by it, it is super gentle and it can be used in so many ways: locking in moisture to dry lips, helping to heal scabs, scars, dry skin and breakouts. I just used a bit of it under my nose while I had a cold, and it kept the area free from dry and painful redness. It comes in a good sized tube which will last forever. This does contain mineral oil and petrolatum and there are many skeptics out there against mineral oil since these ingredients can have a pore-clogging effect on the skin. I haven't encountered any issues with this product and I have very sensitive skin, so just use in small quantities and NOT all over your face, for example. One of the best ingredients is Lanolin- this is the key ingredient to soothing chapped skin. Many high end brands are starting to use this ingredient in their lip products especially, but I would still stick to the smooth and unscented glory of Aquaphor. Lets just say that those Germans behind Beiersdorf (the mother company of Eucerin, Nivea, La Prairie, Labello, etc.) truly know how to make a good moisturizer. This can be purchased at all drugstores. Just to start off on a positive note (not), the packaging of this stuff is crap. A glass jar with a hard plastic spatula in the cap. Why not use a squeeze tube or something? This stuff is sticky, thick, stringy and super messy to take out of the glass jar/spatula contraption. I de-pot this oil into a small container so I can easily dip my finger in to get some product out. Now, this is a healing oil. It helps repair damaged skin and makes a huge difference on healing scabs. I actually mix a bit of vitamin e with my body butter and tea tree oil to help combat ingrown hairs, residual scars and dryness. Make sure, if you are applying this oil, use a SMALL amount and make sure it soaks in. Your pores will get clogged if you put a thick layer of this stuff on your skin. Here is what Sephora has to say about Fresh's clay bar: "Umbrian clay can be used as a deep cleanser, an instantly detoxifying mask, or a spot treatment to heal blemishes and irritation. Due to its high mineral content, Umbrian Clay absorbs toxins, soothes irritations, reduces breakouts, and aids in the regeneration of healthy skin cells. Umbrian Clay occurs naturally and solely in the Italian town of Nocera Umbra. It has been the basis of therapeutic treatments for centuries, dating back to the 6th century B.C." I use this clay bar by wetting it, rubbing my hand over it to pick up some of the clay, and smoothing a thin layer onto my skin. I let it dry for 5-10 mins then wash it off, massaging the clay into my skin to gently exfoliate. It is quite pricy when purchased at Sephora, but I have not yet found another retailer that sells this specific type of Umbrian Clay. Any other clay mask would work similarly, but the benefit of this bar is that you get a LOT more product for the price. This can be purchased at some nutrition stores or at Sephora, in bar form for $46. After testing dozens of salicylic and benzoyl peroxide washes, creams and toners and seeing no improvement, I decided to cut out the chemicals and try something more natural. Just recently, I was working for a designer at the One of a Kind Show in Toronto and came across the Froosh booth. I purchased their Go Deep face wash and I haven't been let down since. This face wash is made with tea tree oil and ground pumice stone, which works as a gentle, clarifying daily exfoliant. I use this wash every single night and absolutely love it. The only downside is the fact that its a bit hard to scoop out of the pot. I use a tiny spatula to scrape out a bit of product, massage it onto my face, then I use my Clarisonic Mia and a gently brush head to really "go deep". I do like the fact that the container isn't too big and the product isn't diluted with a bunch of water and fillers. Big win! This can be purchased at the One of a Kind Show in Toronto, or from their online store here. this is my go-to brush cleanser. I posted my routine here, and it hasn't changed since. The soaps come in both liquid and solid bar form. This soap is gentle enough to be used as a body wash and shampoo, but isn't moisturizing at all so a conditioner and lotion should also be used. I have the mint version which leaves a nice fresh tingle which is lovely on the scalp and elsewhere especially after going to the gym. The soaps are marketed to also be used as an all purpose surface cleaner (dilute with water) and for washing clothing. I would not recommend using this product on very sensitive skin, like the face, since it will be too drying. This product is exactly what it claims to be: A refreshing, lightweight milky self-tanning lotion- an easy, fast way to develop a natural-looking, bronzed effect for the face and décolleté. This is my go-to self tanner for my face, neck and chest. It is incredibly easy to apply and gives noticeable results with only one use. It is non-comedogenic, very gentle and doesn't have a harsh scent. One bottle of this stuff lasts forever, even with daily use. I pour just a dime sized amount onto my fingers, massage it into my skin after a light moisturizer, and sometimes apply makeup over top. The results are not drastic, and for a steady tanned appearance, be sure to apply this product consistently, at least once per day. Also, don't forget to wash it off your fingers right after applying! This can be purchased at some Shoppers Drug Marts and here at Sephora. I hope you found my top 10 great body products list to be helpful in compiling a list of products to try yourself. I firmly stand behind each and every one of these wonderful items and will surely be repurchasing them once they run out!